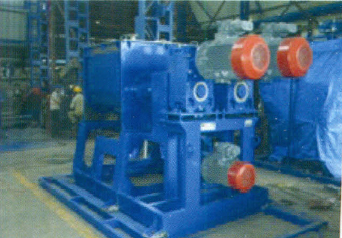 The sigma kneader is a mixer designed to process highly viscous materials. It consists of two blades that rotate towards each other at the same or different speed inside a container. The twin screw basin kneading machine with two horizontally arranged kneading blades, which are deeply geared into one another and strip themselves reciprocally. Each blade moves the material in opposite direction thereby providing excellent cross mixing of all raw materials. The blades pass the trough walls and each other at close clearances resulting in good mixing. The close clearance produces a shearing and tearing action that is beneficial to the size reduction of solids. Selection of appropriate blade shape and speeds result in excellent mixing. * Excellent for kneading and mixing of highly viscous materials like dough, puHy, rubber solutions, adhesives, polymers etc. * The mixing action is a combination of smearing, stretching, folding, dividing and recombining as the material is processed between the sigma blades and the container walls. * Low mixing time approx. 15% less time. * Eliminates the manual task of scraping out sticky/tacky materials. * Eliminates operator exposure to materials of elevated temperatures or of a toxic nature, thereby improving kneading. * Optional extruder provided for removing higher viscous material without titiing.